We’d love your help. Let us know what’s wrong with this preview of The Secret Rooms by Catherine Bailey. 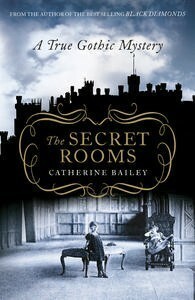 A castle filled with intrigue, a plotting duchess and a mysterious death in Catherine Bailey's The Secret Rooms. At 6 am on 21 April 1940 John the 9th Duke of Rutland, and one of Britain's wealthiest men, ended his days, virtually alone, lying on a makeshift bed in a dank cramped suite of rooms in the servants' quarters of his own home, Belvoir Castle, in Leicestershire. For A castle filled with intrigue, a plotting duchess and a mysterious death in Catherine Bailey's The Secret Rooms. For weeks, as his health deteriorated, his family, his servants - even the King's doctor - pleaded with him to come out, but he refused. After his death, his son and heir, Charles, the 10th Duke of Rutland, ordered that the rooms be locked up and they remained untouched for sixty years. What lay behind this extraordinary set of circumstances? To ask other readers questions about The Secret Rooms, please sign up. Does anyone have suggestions for similar books of the genre/style? Thank you. As another reader wrote, "A lot of fuss over nothing." It is, indeed, a well-researched family history, but while the Duke of Rutland was an important figure in English society, he was a vain and shallow man, married to a vain, petty, and scheming harridan, and together they ruined the life of their son. The first half of the book went quickly, and a sense "mystery" was fueled by mysterious gaps in the family archives. But the last quarter was, I found, sheer slogging as an unearthed cache of a l As another reader wrote, "A lot of fuss over nothing." It is, indeed, a well-researched family history, but while the Duke of Rutland was an important figure in English society, he was a vain and shallow man, married to a vain, petty, and scheming harridan, and together they ruined the life of their son. The first half of the book went quickly, and a sense "mystery" was fueled by mysterious gaps in the family archives. But the last quarter was, I found, sheer slogging as an unearthed cache of a letters unraveled the "mystery" in agonizing detail. If such were the movers and shakers of Edwardian England, and I suspect, elsewhere in Europe, then it is no wonder that a completely preventable war broke out in 1914. Knowing what I know now, I do not think I would have ever begun reading the book. There is a saying: "More money, more problems." After reading this book, I think there should be an addendum for nobility: "More titles, more drama." "The Secret Rooms" is the story of the 9th Duke of Rutland, John Henry Montagu Manners, and the family secrets he tried to hide. Before John died of pneumonia in April 1940, he locked himself into his archive rooms at Belvoir Castle and would not come out, working ceaselessly on a mysterious project, even against his doctor's orders to rest. After There is a saying: "More money, more problems." After reading this book, I think there should be an addendum for nobility: "More titles, more drama." "The Secret Rooms" is the story of the 9th Duke of Rutland, John Henry Montagu Manners, and the family secrets he tried to hide. Before John died of pneumonia in April 1940, he locked himself into his archive rooms at Belvoir Castle and would not come out, working ceaselessly on a mysterious project, even against his doctor's orders to rest. After John died, his son closed the rooms and no one was allowed in them for nearly 60 years. "[John's] obsession with collecting struck me as pathological. The pursuit and ordering of objects appeared to lie at the core of his personality. It seemed to go far beyond mere interest -- it was all-consuming, a compulsion. It looked as if these collections represented some sort of refuge, a form of escape into a private world. But what had he wanted to escape from?" "I was becoming more and more caught up in the mystery behind this man, and starting to follow a different story -- his story. In creating the gaps in his biography, he had erased so much of himself -- and so thoroughly." There were a lot of things I liked about this book: the inside look at a duke's family; the workings of an English castle; the historical setting; the details of how estate life changed during the Twentieth Century; and some fascinating details about the start of World War I, when John was sent to France. Bailey mentions the incredible privileges the ducal families were afforded, but she also discusses the immense social pressures they faced. I liked having this humanist perspective on the bookish, introverted John; it seems he would have chosen a very different life for himself if he hadn't been under a tremendous amount of pressure from his parents to live up to his future role as duke. My complaint about the book was with the writing style. Bailey told the story from her perspective; everything plodded along as she found various letters and clues, and she often closed a chapter with a trite tease, such as: "What I discovered next changed the course of my research entirely." I even wrote ARGH on a post-it to flag such a page. I admit I can be fussy about writing, and other readers might not be bothered at all by the chapter teases -- they might even like them. I wondered if this book could have been better if Bailey had not told it in first-person, because she sometimes got bogged down in too many me-me-me details and descriptions. Could the story have been better told in third person? Despite this complaint, I was still drawn into the story and was anxious to solve the family mystery (or mysteries, to be more correct). The blurbs for this book usually reference Downton Abbey, and I would agree that fans of that TV show would probably enjoy delving into the real-life drama of an aristocratic family. ** I would also recommend it to my fellow Anglophiles, or anyone who likes a good family mystery and historical drama. *While reading, frequently I wondered what kind of archivists we are today, with so many communications only in digital texts, emails or in social media. We save so little correspondence in print. 3.5 When Catherine Bailey goes to Belvoir Castle in Leicestershire, it was with the intention of writing a book about the impact of World War I, on the Duke of Rutland's estate. Let into rooms that had been closed, the 9th Duke having died in them, she finds a treasure trove of letters and other historical documents, she also finds a mystery. Certain time frames have had all letters and documents from all members of the family excised. The mystery of why is too much to ignore and so the focus of 3.5 When Catherine Bailey goes to Belvoir Castle in Leicestershire, it was with the intention of writing a book about the impact of World War I, on the Duke of Rutland's estate. Let into rooms that had been closed, the 9th Duke having died in them, she finds a treasure trove of letters and other historical documents, she also finds a mystery. Certain time frames have had all letters and documents from all members of the family excised. The mystery of why is too much to ignore and so the focus of her book changes. It was very interesting following her as she attempts to piece together the why of the missing documents. Loved following her mind as she makes, at first small, and then larger discoveries. The dukes remaining letters create a vivid picture of the lives and morals of the very top of Edwardian society. From a tragic happening in his youth, to his enlistment in World War I, and his marriage we get a clear glimpse of what life was like for this Duke. Speaking of dysfunctional families, this family had it all. His mother the Duchess was a major=r piece of work, and his father not much better. I did understand and excuse certain things about his father, because he was under enormous pressure to keep up appearances and the large family estate together at a time when all fortunes were declining. The letters detailing his life in the war and the reason he did not go to the front, were very illuminating. From other letters in his possession and the facts uncovered by the author we get a horrifying look at the War, the battle of Ypres, and the major cost of lives on this estate alone. Over two hundred young and older men would die in the war. IF I have one complaint I think a few of these letters could have been kept out without a detrimental effect on the story, they sometimes just seemed like overkill. All in all though this is a solid look at lives of the last few Dukes of Rutland and the uncovering of a mystery that was 1/2 century in the making. Also loved that the author doesn't just end the book but lets us know the fate of all the leading players. Very solid and interesting historical. The author drags you along for over 600 pages, promising revelations, secrets revealed, mind boggling suspense. What you get is a dry history full of a largely unsympathetic main character, his aggravating and shrilly selfish mother, and the rest of his detestable family. One of the main "secrets" is never actually even explained, but constantly brought up throughout the book. Excellent reading fodder if you are trapped on a plane with nothing else to do for about eight hours. I am not giving this book any stars because as much as I tried to get into this book each page was a chore to read. Labeled a gothic mystery it should have been labeled a informational documentary. I read the first 45 percent or a little more of this book. I did find the history good, author Catherine Bailey really did her research, the story was interesting me being a history buff. However it read so boring as just informational. The pictures were nice that were in the book. I only wish I had e I am not giving this book any stars because as much as I tried to get into this book each page was a chore to read. Labeled a gothic mystery it should have been labeled a informational documentary. I read the first 45 percent or a little more of this book. I did find the history good, author Catherine Bailey really did her research, the story was interesting me being a history buff. However it read so boring as just informational. The pictures were nice that were in the book. I only wish I had enough muster to read the entire book I however could not bring myself to that much boredom. An absolutely corking tale, better by far than most novels I’ve read recently. I don’t think I’ve ever read a non-fic book with so many cliff-hangers. My one and only bug bear (and it is but a small gripe) is with the chapters on the Great War where there is, to my mind, a lot of superfluous detail about the war. Obviously some historical background is necessary, to put the events of John’s life into context. I don’t think we needed quite so much as we got. I can’t help but feel that Catherine B An absolutely corking tale, better by far than most novels I’ve read recently. I don’t think I’ve ever read a non-fic book with so many cliff-hangers. My one and only bug bear (and it is but a small gripe) is with the chapters on the Great War where there is, to my mind, a lot of superfluous detail about the war. Obviously some historical background is necessary, to put the events of John’s life into context. I don’t think we needed quite so much as we got. I can’t help but feel that Catherine Bailey’s original intention to write a book about the Belvoir Volunteers - the ‘mysterious army of ploughmen, horsemen and field workers’, an entire generation lost to the war - meant she found herself with a lot of surplus-to-requirements research on her hands that was such good stuff, she was determined to put it in anyway. It’s interesting stuff in its own right, but it’s not all pertinent to John’s story and it does slow the - otherwise terrific - pace dreadfully. It is my only complaint and it’s a VERY small one. In every respect, this is a richly detailed, beautifully (but not overly) descriptive, engaging and terrifically well-written biography of a privileged life with more than its fair share of mysteries. It's a crying shame Ms Bailey never discovered the whole truth about Haddon's death (I so wanted to know!). It seems John covered the details around that particular tragedy far too well. The Secret Rooms is a wonderfully good read. It's 450 pages long and I read it in 3 days, I just couldn't put it down. A brilliant book. Highly recommended. This started out so well and with such promise...."a castle filled with intrigue, a plotting duchess and a mysterious death"
I was hooked from the first page. What was the big mystery? I loved finding out as Catherine Bailey picked away at clues, painstakingly researching this very well written book. Then about halfway through I began to suspect that we'd never really learn the truth. There were too many gaps in the letters, too much of a cover up of events long past. The little facts that were g This started out so well and with such promise...."a castle filled with intrigue, a plotting duchess and a mysterious death"
I was hooked from the first page. What was the big mystery? I loved finding out as Catherine Bailey picked away at clues, painstakingly researching this very well written book. Then about halfway through I began to suspect that we'd never really learn the truth. There were too many gaps in the letters, too much of a cover up of events long past. The little facts that were gleaned, were by that time very disappointing. I've been bouncing around thoughts on Catherine Bailey's The Secret Rooms for a couple of weeks now, vainly trying to convince myself that I don't know what I want to say when in reality I've just been putting off a review I wasn't in the mood to write. Something about wanting to like a book more than I did, having to rectify deflated expectations against the reality of experience, call me crazy but it just doesn't insight much enthusiasm. Now, before I get too far ahead of myself I want to say I love the mystery Bailey uncovered at Belvoir Castle. I think it a genuinely authentic intrigue that says a lot about the family's dynamics, society in the early twentieth century, etc. and so on. Honestly, if The Secret Rooms were streamlined exclusively to the mystery surrounding John Henry Montagu Manners, 9th Duke of Rutland, and restructured to follow a chronological timeline of his movements, I'd be giving this book four stars if not five, but that's not Bailey's style. No, Bailey skips back and forth over the established timeline, making it necessary for the reader to piece together events from a chaotic hodgepodge of information and often follows random tangents about flowers, sunlight or minor characters for pages before returning to her central story. She also tends to make mountains out of mole hills, routinely overemphasizing events that are only loosely related to her primary subject and finally, her penchant for repeating herself ad nauseam is more than a little annoying. Whatever it was that kept the Duke closeted in his secret rooms in the last hours of his life haunted his family too. Shortly after he died, his son, Charles, the 10th Duke of Rutland, closed them. In 1999, almost sixty years later, they were finally opened to outsiders. Today, only a handful of people have been inside them. Had I stumbled across something? Was there a link between the missing war letters and whatever it was the family had wanted to hide? Briefly, I explained what I had discovered: how, after 6 July 1915, until December of that year, there was a large gap in the family's correspondence, and that the start of this void coincided with the date John's war diary had stopped. I focused on the three missing periods. There was the gap in the summer of 1915 when John had been on the Western front, and which had begun with the blank pages in his war diary. Then there was the one in the summer of 1909 - the year he was at the embassy in Rome. The third gap - in 1894 - was the most mysterious of all. The bought that John had felt compelled to cover up an event in his childhood was disquieting. In order to avoid spoilers, I won't add anything else concerning the Rutland's family secrets. The author made a meticulous research work involving the reader in this suspenseful book. I am looking forward for her first book written, The Black Diamonds. Catherine Bailey visited Belvoir Castle with the intention of writing about the part played by the Rutland family and the workers from the estate during the First World War. When she started to do her research she stumbled upon a mystery that had been hidden for many years, once she started to delve, she came across a story that has now become the focus of this book - a completely different book to that which she had planned, but one that is incredibly detailed and often reads like a fiction nov Catherine Bailey visited Belvoir Castle with the intention of writing about the part played by the Rutland family and the workers from the estate during the First World War. When she started to do her research she stumbled upon a mystery that had been hidden for many years, once she started to delve, she came across a story that has now become the focus of this book - a completely different book to that which she had planned, but one that is incredibly detailed and often reads like a fiction novel. After years of reading fictional gothic horrors, it's kind of a weird delight to discover that there are even stranger things going on in real life. As mentioned in my review of Black Diamonds, I loved it so much I immediately had to get a hold of this, which was her first book. Baily is an historian who is granted access to the Duke of Rutland's private archive. She's going through these beautifully stored and catalogued collections of letters (so many letters), and there are three gaps. The res After years of reading fictional gothic horrors, it's kind of a weird delight to discover that there are even stranger things going on in real life. As mentioned in my review of Black Diamonds, I loved it so much I immediately had to get a hold of this, which was her first book. Baily is an historian who is granted access to the Duke of Rutland's private archive. She's going through these beautifully stored and catalogued collections of letters (so many letters), and there are three gaps. The rest of the book is the painstaking collection of evidence to fill in those gaps and solve those mysteries. It's like watching Sherlock at work, as Bailey describes what she has to find next, and how, only she reveals what she discovers as it comes to light. The process is fascinating, as are the things those people got up to a century ago, not least because where did they find the time to plot and write all those letters? The most entertaining sort of history. It's amazing, really, how quickly family history can be hidden. Props to the current Duke and Duchess of Rutland, for giving Bailey such access and assistance. This book bills itself as more riveting than it is. It does have a mystery- three actually- but is limited by the destroyed historical record, made all the more intriguing because it was done by John, the protagonist. Bailey is great at creating tension and suspense, but the pay off is extended and not complete enough. I would recommend reading this book if you know you can finish it in a short period of time; I read it in a week and that pace was even agonizing for the reveal. Slight spoilers b This book bills itself as more riveting than it is. It does have a mystery- three actually- but is limited by the destroyed historical record, made all the more intriguing because it was done by John, the protagonist. Bailey is great at creating tension and suspense, but the pay off is extended and not complete enough. I would recommend reading this book if you know you can finish it in a short period of time; I read it in a week and that pace was even agonizing for the reveal. - I wish the ending would have had a coda, with the author trying to link all three cuts together. -When she "solves" the mystery and heads on to the next to "follow a lead" I feel like there should be more resolution, but the nature of the document chain doesn't allow this. If I didn't know this was true I would have given sincere congratulations to the author for a very well balanced and inspired tale worthy of a movie adaptation...this reads like a Brideshead Revisited or an Agatha Christie mistery - even if none of the deaths happen on purpose. The Secret Rooms started, as the author notes, with a very different purpose/topic in mind - to investigate the background of the many that fought and died in WW1, more specifically the men belonging to the estates of the If I didn't know this was true I would have given sincere congratulations to the author for a very well balanced and inspired tale worthy of a movie adaptation...this reads like a Brideshead Revisited or an Agatha Christie mistery - even if none of the deaths happen on purpose. The Secret Rooms started, as the author notes, with a very different purpose/topic in mind - to investigate the background of the many that fought and died in WW1, more specifically the men belonging to the estates of the Dukes of Rutland. However, as CBailey is given access to the family papers, locked away since the 9th Duke's death is 1940, a different story literally falls into her lap and leads her on a journey just as compelling as any Gosford Park or Downton Abbey - only this time its the real deal. When he died on April 20th 1940 the 9th Duke of Rutland, John, had spent the last years of his life metodically going through his family archives - no one really sure of what exactly he was doing, but so intent on it that he spent his last days locked away in those rooms and died in there. His son inherits the Dukedom and then proceeds to lock away the Muniment Rooms and its content, until the time that the author comes along to investigate the ties of the family to ww1 and the lifes of the men who fought in it. Sorting through boxes and boxes and papers she comes across missing pieces of information in the life of the Duke and these end up taking her in a completely different journey through the life of John, 10th Duke of Rutland. Having become heir to the tittle by the early, and tragically sad death, of his big brother Haddon, John carries most of his life the guilty of this death and the heavy burden his grief consumed mother and his distant father place on his shoulders. Intrigued yet?...lol..you should be, i'm not making this one up, I promise! This reads really well, and makes for a compelling read, especially for anyone interested in british society during WW1 - especially british high society. The author assumes a secondary role, almost one of simply gathering information, and letting these ghosts of Christmas past do all the talking through the many many letters she uncovered over the course of her research - ah, the wonderful art of proper letter writing...shame its almost gone. What I found especially interesting was the many passages devoted to WW1, John was involved in it, and through letters and diary extracts we are given a privileged look at a world long gone, but still fascinating and compelling. I wont go into plot details, I don't want to spoil the fun of reading this one - suffice to say its worth the time and trouble...yes indeed it is! The style of writing was a times a little tired but nonetheless, the story alone is worth all effort! I don't usually read a lot of non-fiction but something about this story really drew me in and, to use that well-worn cliche, "you couldn't make it up". From a daunting mountain of documents, Catherine Bailey has succeeded in excavating an intriguing and involving true story of one man's life - a very sad story emerges as she fills in the gaps in the life story of John Manners, the 9th Duke of Rutland. This is a very detailed and extremely well researched account which highlights the immense powe I don't usually read a lot of non-fiction but something about this story really drew me in and, to use that well-worn cliche, "you couldn't make it up". From a daunting mountain of documents, Catherine Bailey has succeeded in excavating an intriguing and involving true story of one man's life - a very sad story emerges as she fills in the gaps in the life story of John Manners, the 9th Duke of Rutland. This is a very detailed and extremely well researched account which highlights the immense power held by the Manners family - power which is abused by Violet, John's mother, who is portrayed as a manipulative matriarch, determined to safeguard the future of the family line, at any cost. Could duty to one's family possibly override duty to one's country at a time of war? When you don't have the luxury of "an heir and a spare" does the end justify the means? The ninth Duke of Rutland died in 1940 in a suite of rooms which was then sealed by his son. For many years no one was allowed in the rooms. Catherine Bailey, the author of this fascinating book, was allowed access to them and to Belvoir Castle archives so that she could find out how World War I had affected the ordinary people of the area. Before long she realised there was another mystery she needed to investigate and write about. Why had the ninth Duke spent the last years of his life closeted The ninth Duke of Rutland died in 1940 in a suite of rooms which was then sealed by his son. For many years no one was allowed in the rooms. Catherine Bailey, the author of this fascinating book, was allowed access to them and to Belvoir Castle archives so that she could find out how World War I had affected the ordinary people of the area. Before long she realised there was another mystery she needed to investigate and write about. Why had the ninth Duke spent the last years of his life closeted in these rooms? Why were there three conspicuous gaps in the records and in the family's personal correspondence? Why were these small rooms sealed after his death? Unravelling the mystery took a great deal of clever detective work because John Manners, the ninth Duke of Rutland, had been very thorough in his attempts to cover up those three periods in his, and his family's life. Unfortunately for him, death had claimed him before he was able to complete his task. There were still bits of information scattered throughout the castle archives which provided clues to the missing months in 1894, 1909 and 1915. I really enjoyed this intriguing historical detective story which is even more interesting because it actually happened. What emerges from the book is a fascinating picture of a family which probably today would be labelled dysfunctional. John Manners was sent away from his parents after the sudden death of his brother and was brought up by his maternal uncle to whom he was very close. His mother, Violet, was manipulative and a thoroughly unpleasant character who believed that aristocratic families were still above the law even in the twentieth century. His father, Henry, was patriotic but believed he had to live in a certain style which the income from his vast estates could no longer support. Both parents had idolised their dead eldest son and rather despised John, their second son. John himself had wanted an academic career but let himself be talked out of it. I found this book compulsive reading and was fascinated by the way the author managed to work out the possible explanations for the gaps in the records. The solutions to the mysteries give an insight into how strings could be pulled by those who knew the right people. I am big fan of books, both fiction and non-fiction, about the lives of the aristocracy in late 19th Century and early 20th century Britain. Their traditions and way of life were quickly becoming unsustainable and irrelevant and their stories make great reading with many opportunities for humor. But, as much as I love the works of Evelyn Waugh and Graham Greene, it is the non-fiction books that I really pull me in, and The Secret Room is one of the best. Bailey sets out to write a book about the I am big fan of books, both fiction and non-fiction, about the lives of the aristocracy in late 19th Century and early 20th century Britain. Their traditions and way of life were quickly becoming unsustainable and irrelevant and their stories make great reading with many opportunities for humor. But, as much as I love the works of Evelyn Waugh and Graham Greene, it is the non-fiction books that I really pull me in, and The Secret Room is one of the best. Bailey sets out to write a book about the WWI experiences of young men from the villages surrounding the estate of the Duke of Rutland and requested access to the family archives in order to do her research. John Manners, the 9th Duke, had been a young man at that time and had served for a time in France and she hoped to find good material in his files. But conversations with staff and family told bizarre stories of secrecy, intrigue and strange occurrences around the time of this death, and when she started to comb through the Duke’s diaries and letters she discovered three periods of time when the pages were strangely blank despite the fact that Manners had been an obsessive individual who had meticulously written about the rest of his life. Bailey tells the story of how she ferreted out the truth and you discover along with her what the Duke was trying to hide. While in the end the mysteries themselves were not so shocking, the behavior of many, though certainly not all, the titled and powerful, were. John’s mother, Violet was a beautiful and manipulative woman, as well as being a prolific writer and her letters contained some disquieting attitudes and scandalous intrigues. As I read this book I was reminded once again that novelists such as Waugh and Greene should be admired not so much for their cleverness but rather for their powers of observation. Perhaps it is because of all the hype, but I found this book to be less than desired. Bailey discovers that a former lord of the castle has destroyed some correspondances for certain years and sets out to find out why. She can write; it is a galloping read. Yet, I don't quite understand why Violet is a bad mother for not wanting her son to die in WW I. Yes, what she did was classist and all, but it almost seems like Bailey wants her to be the bad woman in every situtation as opposed to a mere human who might be not want another child to die before her. Thoroughly enjoyed reading this, and it confirms by belief that truth is always far, far stranger than fiction. I loved Catherine Bailey's earlier book Black Diamonds so had high hopes for The Secret Rooms and I wasn't disappointed. Hard to review it without giving away some of the secrets she discovers during her research. Recommended. Overall pretty interesting but the big family secrets that are supposed to be so mysterious are much ado about nothing really. Recommends it for: anyone wishing to learn about WWI & British aristocracy. WOW! This is one of my favorite types of books. I love stories that turn research into an adventure. It was one of the things I liked about "Possession" by A.S. Byatt. The whole time I was reading Possession, I kept wishing it was non-fiction. "The Secret Rooms" is my non-fiction research adventure. I saw this book in Barnes and Noble. Another browser had left it in the Mystery section, so when I started looking it up, it took me a while to really clarify that it was non-fiction. I still wasn't WOW! This is one of my favorite types of books. I love stories that turn research into an adventure. It was one of the things I liked about "Possession" by A.S. Byatt. The whole time I was reading Possession, I kept wishing it was non-fiction. "The Secret Rooms" is my non-fiction research adventure. I saw this book in Barnes and Noble. Another browser had left it in the Mystery section, so when I started looking it up, it took me a while to really clarify that it was non-fiction. I still wasn't sure if I wanted to own my own copy, so I went home and read the sample on Amazon. I was hooked! I started to look and see if my library had the book. It's a new book, and apparently popular, because all the copies are checked out. But...I was able to figure out how to check out an electronic copy from the library and finish it in a day and a half. I was so intrigued all the way through. Some of the reviews of the book didn't like it when the author went away from the historical narrative to tell how she had to find other sources to find answers to the mystery she discovered in the archive, but I felt like it added to the sense of searching. It gave me a lot of respect for the years of research she put into this project. How this author accomplished this tour de force tome is beyond me. The prodigous and brilliant research that went into this book is astounding. Tiny leads in family archives are followed up in national archives dating from pre to post WWI, to create a painstakingly accurate non-fiction read. As if her skills as a researcher were not enough, the author couples this with brilliant writing, creating a book that will keep you awake at night with suspense and fascination. It reads like an excellently How this author accomplished this tour de force tome is beyond me. The prodigous and brilliant research that went into this book is astounding. Tiny leads in family archives are followed up in national archives dating from pre to post WWI, to create a painstakingly accurate non-fiction read. As if her skills as a researcher were not enough, the author couples this with brilliant writing, creating a book that will keep you awake at night with suspense and fascination. It reads like an excellently written mystery novel which is all the more fascinating because it is true! The world of the British upper ten thousand before the Great War seems so alien, so bizarre nowadays: the privileges they had! the houses! the wealth! the intrigues! But that's what made their world so fascinating- a world that doesn't exist anymore even though it is relatively recent history. Catherine Bailey's The Secret Rooms: A True Story of a Haunted Castle, a Plotting Duchess, and a Family Secret takes us right into the stately Belvoir Castle, residence of the Duke of Rutland. Not only int The world of the British upper ten thousand before the Great War seems so alien, so bizarre nowadays: the privileges they had! the houses! the wealth! the intrigues! Catherine Bailey's The Secret Rooms: A True Story of a Haunted Castle, a Plotting Duchess, and a Family Secret takes us right into the stately Belvoir Castle, residence of the Duke of Rutland. Not only into the castle, but right into its secret rooms. Rooms that the son of the 9th Duke of Rutland had locked up immediately after his father's death. Catherine Bailey who came to Belvoir Castle to write a completely different book and found herself in the middle of a true mystery describes the maze-like halls and corridors, the castle's employees that are shocked to find her in the "forbidden rooms" and of course the mystery of the last hours of John, the 9th Duke of Rutland. Whilst sorting through the archive's papers she detects that there are three periods of John's life missing. It soon becomes clear that each period must have been meticulously erased by destroying any evidence exisiting in papers or letters from that time. The first half of the book tries to reconstruct what might have happened in those three missing periods. It is exactly what the title promises and an easy read. The author tends to include letters and snippets of information that are not necessarily useful to the actual mystery, but give a good insight into the Duke's family and their lives in the castle. But: I can't really blame the author for including all that. If I sat in a castle's room full of boxes with the former inhabitant's letters and correspondence, I'd probably couldn't resist being nosy reading through all that material. The second half of the book is a bit more of a drag to read through. The final mystery turns out to be not that mysterious and there are too many letters and too many details given, to keep up the pace of the story. My only criticism and lack of a four star review would be the minutiae that could have benefitted from an editor's red pen. Keeping in mind this book is history, not historical fiction, that fault finding might be unwarranted. The story revolves around a highly dysfunctional English family, their home Belvoir Castle, World War I, and the machinations of a cruel and manipulative matriarch. Worth the read if you are an Anglophile. Such an amazing story. All true. After the Duke of Rutland dies his son locks his rooms behind him never to be opened. And when they are, what a story they tell! My family were totally neglected as I rushed to reach the end of this book. Very interesting story of a secret deeply hidden but dug up by the author's determination to find what a duke spent his last days burying in the past. Bailey starts researching the annals of Belvoir, home of the Dukes of Rutland, to write a totally different story about the soldiers of WWI. Instead she finds an incredibly rich troves of letters and diaries in a room kept sealed up for 20 years. Correspondence from three very distinct periods is missing, and it's tally-ho, Bailey is on the hunt. F Very interesting story of a secret deeply hidden but dug up by the author's determination to find what a duke spent his last days burying in the past. Bailey starts researching the annals of Belvoir, home of the Dukes of Rutland, to write a totally different story about the soldiers of WWI. Instead she finds an incredibly rich troves of letters and diaries in a room kept sealed up for 20 years. Correspondence from three very distinct periods is missing, and it's tally-ho, Bailey is on the hunt. Fortunately for her, when the aristocracy was not busy hunting, changing clothes, traveling from stately home to stately home, and committing adultery , they were writing letters. Gloriously long and detailed. The description of her research in many archives, both familial and military , is fascinating, as is what she discovers. It seems that guilt is as much a motivator as the love of money. The first half of this book was very intriguing. The mystery surrounding the family's historical documents and the WWI setting was interesting, especially the bits of John's war diary. But the second half began to drag quite a bit...the back and forth of the letters was a little slow, especially since the manipulation and reasons for it were pretty evident. Still glad I picked this one up overall, though. I didn't want to read this, I wanted to absorb it through osmosis. Completely and utterly fascinating. I know the references to Downton Abbey are overused to describe this book, but they do apply. Reading about that period of time is fascinating and hearing it described through letters, documentations and household accounts made it very real. The pomp and circumstance seems so foreign today and the lavish lifestyle completely alien. The distractions and machinations going on behind the scenes dur I didn't want to read this, I wanted to absorb it through osmosis. Completely and utterly fascinating. I know the references to Downton Abbey are overused to describe this book, but they do apply. Reading about that period of time is fascinating and hearing it described through letters, documentations and household accounts made it very real. The pomp and circumstance seems so foreign today and the lavish lifestyle completely alien. The distractions and machinations going on behind the scenes during war time defy belief. It would be easy to believe that the accounts of time and energy expended on behalf of a few select aristocrats would be exaggeration, but it's not. The amount of documentation that survived is mind boggling. I hope it is all getting scanned for history's sake. I had to keep reminding myself that this was not a work of fiction. I enjoyed reading the author's explanations that accompanied letters. It enabled me to keep the timeline and characters in order. This could have been so confusing but it was not. It was extremely well written and researched. The accompanying photos were wonderful. They do not come across on a regular Kindle well so I used my Kindle for PC app to get a better look at them. It's difficult to review this without spoilers I wanted to like The Secret Rooms a lot more than I did. The promise of a gothic mystery and scandalous tales of the upper crust spurred me on, but I just didn't care all that much about the Duke and I didn't find the story very interesting because he wasn't all that interesting to me. I wanted more of the glamour and dazzle of his sister, Lady Diana Cooper, and found instead a sad man locked up in a room trying to make himself and his life go away. Maker of successful television series and documentaries.